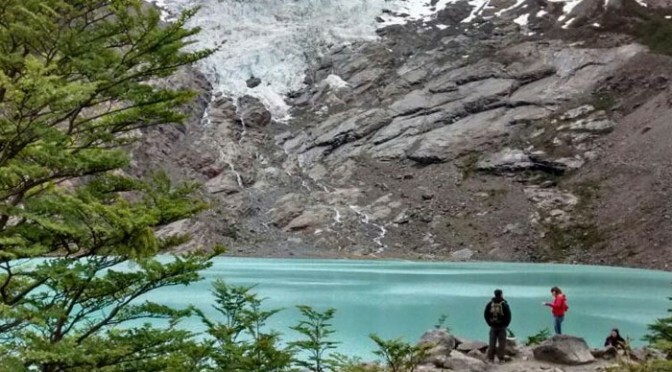 The trekking to Huemul Glacier is an attraction in itself, with a forest of its own considered to be one of the most beautiful places for a walk in El Chalten. Before stepping onto our trekking trail of the month, we would like to share with you a curious fact about this destination. Huemul, which happens to be the name of this glacier, is a small deer among the endangered species, whose speed, cunning and size make it almost impossible to see. We travel 38km to the north from El Chalten, where we can enjoy a gorgeous landscape in between the mountains, with a view to Mount Fitz Roy. Our tour skirts part of the trail towards Rio de las Vueltas until we get to Laguna del Desierto where you´ll find the namesake Camping Site, starting point to the Huemul Glacier trekking, where we´ll pay for our visitor´s tickets. The access road is in a private property, that´s why the fee we pay is kind of symbolic (payable personally in place) to just cover some basic services at this place, which is the beginning of our incredible adventure. At first the road seems to be easy and smooth because the terrain is flat enough to be able to walk fast and without stops. As we begin to skirt brooks and walk across a couple of bridges all of a sudden the road starts changing, at times it gets dark and at some other times it gets a little steeper. After walking for 1 hour we arrive at the Huemul Glacier. “Different from all we know” is one of the most repeated phrases when referring to this trekking. And they are right. The trail meanders through a forest that at times turns into something special and makes us think, because of its unique characteristics, of the movie “ Lord of the Rings” when Frodo goes deep into adventure. But we´ll have to climb to reach our goal. The road zigzags among trees, that´s why a walking-cane or a stick come in handy, thus be able to climb the best possible way without putting our steps at risk. The Huemul Glacier is beautiful and its beauty is not only visible in the ice or the eternal snow, but also in the surrounding area that turns this view into a real postcard. A slope, that seemed to be the last one, made us think that we were already there and that we had to make just a last little effort. But on the other side we found the much sought after prize: the great emerald lagoon and its glacial water that was waiting for us with its particular beauty. After a few minutes we started on our way back along the trail led us up to here. The thing is, without a doubt, that the Huemul Glacier trail has a magic of its own that makes it different from other trails, and of course deserves to be visited and admired. This is an excellent tour that can be enjoyed in our different versions of Fly & Drive or Hike & Drive before going back to El Calafate. You can book it through your Kallpatour´s Account Executive when passing through Patagonia.